Will the Shropshire and Wolverhampton walls pay? Part-paywalls have gone up at the UK’s biggest-selling regional daily, the Wolverhampton-based Express and Star, and at sister title, the Shropshire Star. Breaking news will remain free but other content, such as football reports, are now behind the wall. But will Wolverhampton and Shropshire pay? At £2.19 more a month than the Times, is £12.18 too high a price for a monthly digital-only subscription? Last week the Times, which went behind a paywall last summer, announced that it has 79,000 digital subscribers and the Financial Times, which has been behind a metered pay model for 10 years as of yesterday, also claims success with 210,000 subscribers. But the Times and FT have their own reasons for tens of thousands of digital subscribers. The Times had a huge push to create high-value content as it went behind the wall and the Financial Times is perhaps best seen as a specialist publication with a wealthy readership prepared to pay for financial news. Paywalls put up by UK regional newspapers have been less successful. Johnston Press trialled a paywall in 2009, testing it on some of the group’s smaller websites, the Southern Reporter in Scotland, the Northumberland Gazette and the Whitby Gazette, charging just 40 pence a week for access. The wall was dismantled after three months as it was deemed not viable. There is a difference in the Express and Star’s approach and Johnston Press’ tactics though, in that the Wolverhampton and Shropshire titles are trying to push their print subscriptions, adding digital as an optional extra and are charging just 40 pence a week more for the print, online and smartphone deal than digital-only. The exact cost may not be the deciding factor in whether readers decide to get their credit cards out. The Johnston Press paywall was very cheap – just £1.71 a month – but few paid. 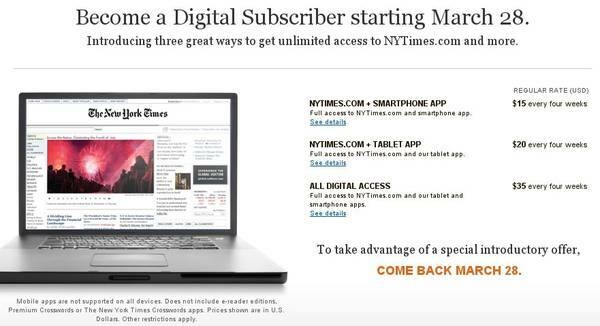 The New York Times, which went behind a metered-paywall last week, believes readers will pay up to $35 a month, which is the cost for a combined online, iPad and smartphone subscription (though readers were eased in with a £0.99 a month charge). The Express and Star has taken the bold step of becoming the first major regional newspaper in the UK to go behind the wall. If it invests in high value content, makes payment easy, has an engaged audience already and can convince advertisers a quality rather than a quantity of online readers is more important, then the wall might work. If not, then the wall may come tumbling down. Express and Star deputy editor Keith Harrison has told Journalism.co.uk he is confident the premium content site will be a success. This entry was posted in Business, Comment, Newspapers, Online Journalism and tagged paid content, pay walls, paywalls, shropshire star, wolverhampton express and star on April 5, 2011 by Sarah Marshall. Four months ago, the Waco Tribune-Herald launched a premium content payment model, keeping breaking news, obituaries and other sections free but introducing levies on more in-depth work. Knight Digital Media Center blogger Michele McLellan has posted an interview with Tribune-Herald editor Carlos Sanchez, and although he can’t divulge the numbers it sheds some light on how communities may respond to such a model. Q. How do you decide what content is for online subscribers only? Our strategy from the beginning was to keep things as simple as possible. Generally, if it’s a wire story that is available at other websites, it’s free; if it is something locally produced, it’s behind a pay wall. There are broad exceptions: staff written blogs, breaking news and, most important, obituaries (are free). Our thinking behind the blogs was that our reporters could offer more of a social media feel, with links to content behind the pay wall. Ideally, it would replicate the kind of banter that we hear every day in a newsroom in which the story behind the story becomes just as fascinating as the story itself. This entry was posted in Business, Newspapers, Online Journalism and tagged Knight Digital Media Center, pay walls, paywalls, social media, waco tribune-herald on January 20, 2011 by Joel Gunter. Paywall technology venture Journalism Online will see its Press+ system introduced to non-profit news sites in the US as part of a deal with the Knight Foundation. The first 10 sites that receive grants from the Foundation will not have to share revenue from the system with Journalism Online for the first year. Hyperlocal professional news site the New Haven Independent is the first to sign up. This entry was posted in Business, Editors' pick and tagged Journalism Online, Knight Foundation, paid content, pay walls, paywalls, us on September 23, 2010 by Laura Oliver. and deal with the payment transaction early on. Related listening: Podcast from the Association of Online Publishers event on paywalls and diversifying revenue streams with the Times’ assistant editor and head of online, Tom Whitwell. This entry was posted in Business, Editors' pick, Online Journalism and tagged New York Times, paid content, pay walls, paywall, paywalls, The Times, us on July 9, 2010 by Laura Oliver. The Times have always acknowledged that the paywall would mean a drop in traffic. They accept that many former visitors to the site will not be prepared to pay. But where will they go instead? Will they break their readership loyalities? The point is taken up by Martin Belam, information architect for the Guardian.co.uk, who says we cannot assume that readers will simply defect to another online newspaper. Writing on his blog, Belam says to assume so would be to “view our industry through the prism of the newsagent”. The web isn’t a newsagent. It is rather more like the table in a library with newspapers scattered across it, ready to be picked up and browsed at will. And unlike the newsagent, that library table is no longer confined to publications ‘registered with the Post Office as a newspaper’. Many Times readers, he adds, “might just give up on all newspapers websites”. This entry was posted in Business, Editors' pick and tagged Martin Belam, pay walls, paywalls, The Guardian, The Times, times.co.uk on July 8, 2010 by Rachel Bartlett.